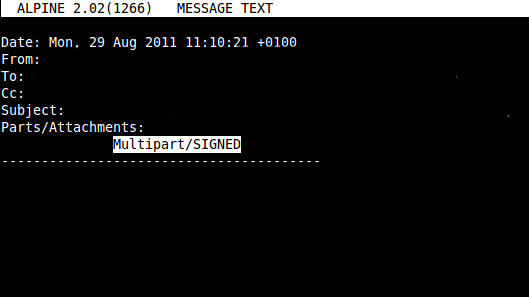 Mutt can handle MIME/PGP multipart messages out of the box. This is a nightmare on Alpine. I have yet to find someone who gets topal to run in less than a day. 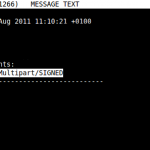 Google contacts can be accessed from Mutt using goobook. With header and body caching enabled, Mutt is way faster at browsing IMAP directories. Mutt makes it embarrassingly simple to backup remote mail to a local drive: Simply save it to a local mail folder. Mutt will let you delete mails from a gmail IMAP inbox. Pine, Alpine and Re-Alpine seem to be unmaintained as of March 2012. Mutt is comparatively lively. > Mutt makes it embarrassingly simple to backup remote mail to a local drive: Simply save it to a local mail folder. It’s exactly the same in pine.